Then one February morning Mia goes for a drive with her family, and in an instant, everything changes. Suddenly, all the choices are gone, except one. And it's the only one that matters. 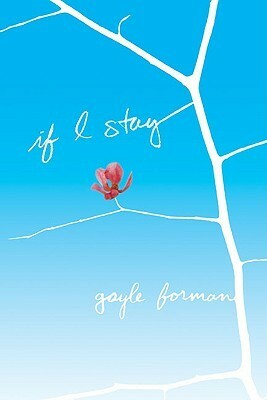 If I Stay is a heartachingly beautiful book about the power of love, the true meaning of family, and the choices we all make. I am not sure what I was really expecting out of this book, but it did not live up to my expectations. Most of the book was spent living in the past telling the story of Mia’s life through flashbacks. This helped to show the relationships between her and the people in her life, but it got dragged out and boring at times. The characters were pretty well written. I felt like I knew them all pretty well by the time I was done. The dialogue flowed really well between them as well. Character development was the best part of the book. The story itself is interesting before you get into it. The execution comes up a bit short. I felt that there should have been more about the accident and maybe her condition instead of all of the flashbacks. A good majority of them served a purpose, but a few could have been left out for a more relevant story-line. I thought there would be more drama surrounding her decision. I didn’t feel emotionally tied to it or her character at all. Maybe that is why I wasn’t as into it as the next reader. That said, I want to read the sequel. 4/5 stars. I did really enjoy it, I was just expecting more.